Natural Animal's Herbal Shampoo & Dip gives your pet a luxurious deep cleansing shampoo bath. Pleasant smelling with oils of Citronella and Cedar. Cat shampoo may be used on ferrets, rabbits, and other small mammals. 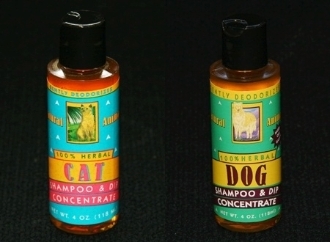 Ingredients: Coconut Oil Shampoo, Vegetable Glycerin, Oils of Orange, Cedarwood, Citronella, Eucalyptus and Bay.